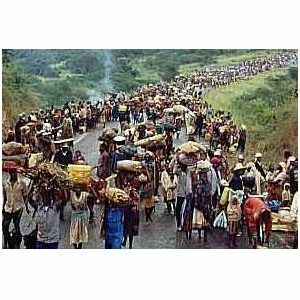 Home » Sustainable development » Over a billion climate refugees in 2050 ? Over a billion climate refugees in 2050 ? According to two different sources – the UNHCR and the NGO Christian Aid – as much as a billion people may find themselves homeless or stateless by the middle of century. Stateless might be too strong a word, but with the situation of countries like Bengladesh and many islands threatened by rising sea levels, this is a reality. As if this was not enough, additional causes include decreasing crop yields and water shortages in Africa, Asia and Latin America. Hundreds of millions could be forced to go on the move because of water shortages and crop failures in most of Africa, as well as in central and southern Asia and South America, the conference in London will be told. There could also be an effect on levels of starvation and on food prices as agriculture struggles to cope with growing demand in increasingly arid conditions. Rising sea levels could also cause havoc, with coastal communities in southern Asia, the Far East, the south Pacific islands and the Caribbean seeing their homes submerged. North and west Africans could head towards Europe, while the southern border of the United States could come under renewed pressure from Central America. The conference will hear a warning from the UN High Commissioner for Refugees (UNHCR) that the developed world should start preparing for a huge movement of people caused by climate change. Global warming will create at least one billion refugees by 2050 as water shortages and crop failures force people to leave their homes, sparking local wars over access to resources, a leading aid agency said on Monday. In its report “Human tide: The real migration crisis”, Christian Aid said that as the developed world was responsible for most of the climate-changing pollution, it should bear the brunt of the cost of helping those worst hit by it — the poor. “We believe that forced migration is now the most urgent threat facing poor people in the developing world,” said lead author John Davison. (…) Security experts fear that the tidal wave of forced migration will not only fuel existing conflicts but create new ones in some of the poorest and most deprived parts of the world, those least equipped to deal with them, it said. “A world of many more Darfurs is the increasingly likely nightmare scenario,” the report said, citing the conflict in the western Sudan where the United Nations says at least 200,000 people have been killed and 2 million forced out of their homes. While many climate refugees would cross national borders — becoming an international problem — many millions more would be unable to leave their countries and would remain largely invisible to outsiders, it said.